To be honest, I’m not totally sure why we made apple cider caramels in the middle of winter. Apple cider is usually a fall kind of thing. Regardless, though, they are awesome. Chewy (but not stick-to-your teeth kind of chewy), buttery, and tangy. They taste like apple cider and cinnamon, but who says that you can’t use those ingredients year round? You’d be missing out! 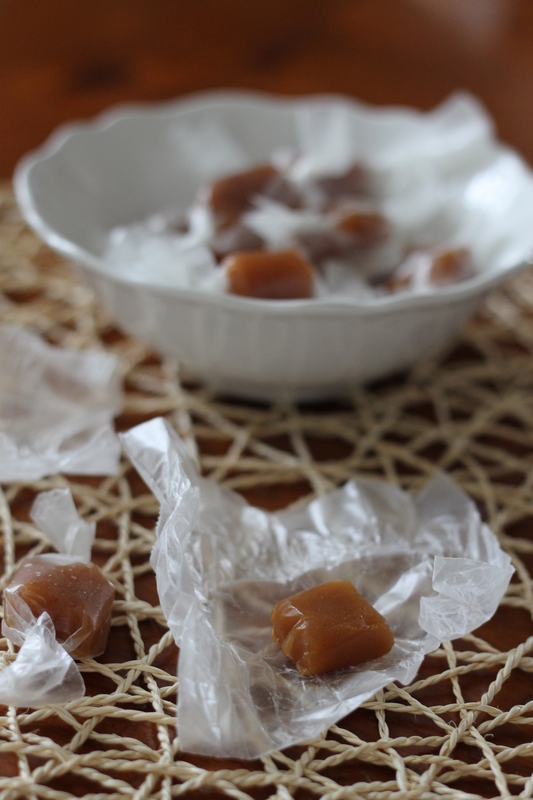 Another great thing about these caramels is that they are surprisingly easy for homemade candy. We had never attempted anything like this before, but they weren’t really much harder than anything else. The only tricky thing it getting the temperature right. Usually you are supposed to use a candy or deep-fry thermometer, but since we didn’t have one that was accurate, we just used our instant read thermometer, checking the temperature every minute or two and then keeping it in towards the end. The caramels were the perfect texture, so if you don’t have a candy thermometer, don’t worry. 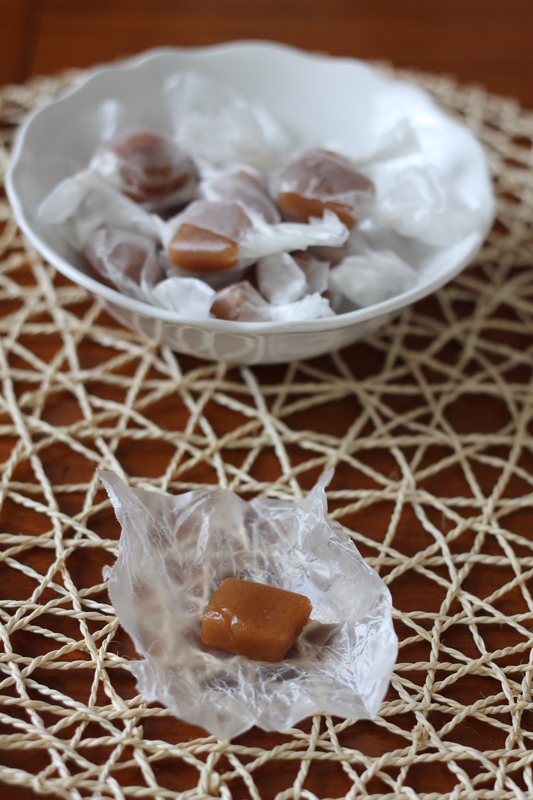 These caramels were so awesome that we can’t wait to try some plain vanilla ones sometime soon! Boil the apple cider in a 3- to- 4- quart saucepan over high heat until it is reduced to a dark, thick syrup, between 1/3 and 1/2 cup in volume. This should take at least a half hour, but could take up to about 45 minutes. Stir occasionally. Meanwhile, prepare the other ingredients. Line the bottom and sides of an 8- inch straight- sided square metal baking pan with 2 long sheets of crisscrossed parchment. Set it aside. Stir the cinnamon and salt salt together in a small dish. Once you are finished reducing the apple cider, remove it from the heat and stir in the butter, sugars, and heavy cream. Return the pot to medium- high heat with a candy thermometer attached to the side, and let it boil until the thermometer reads 252 degrees, about 5 minutes. Or, use an instant read thermometer and check every couple of minutes. Watch it carefully, because if you overcook it, the caramels will be hard. Immediately remove caramel from heat, add the cinnamon- salt mixture, and stir to distribute it evenly. Pour caramel into the prepared pan. Let it sit until cool and firm, about two hours. Or, put in in the fridge for about an hour. Once caramel is firm, use your parchment paper to transfer the caramel to a cutting board. Use a well- greased knife, oiling it after each cut, to cut the caramel into 1-by-1-inch squares. Wrap each one in a 4-inch square of waxed paper, twisting the sides to close. The caramels are relatively soft at room temperature, and slightly firmer from the fridge. Once they are wrapped, they can be stored in an airtight container for up to a week or two. Enjoy! Note: If you don’t have flaky sea salt, you can use a different kind. If the salt is finer-grained, cut back on it a little, or your caramels will be too salty. This is because more salt will be able to fit by volume into your measuring spoon.